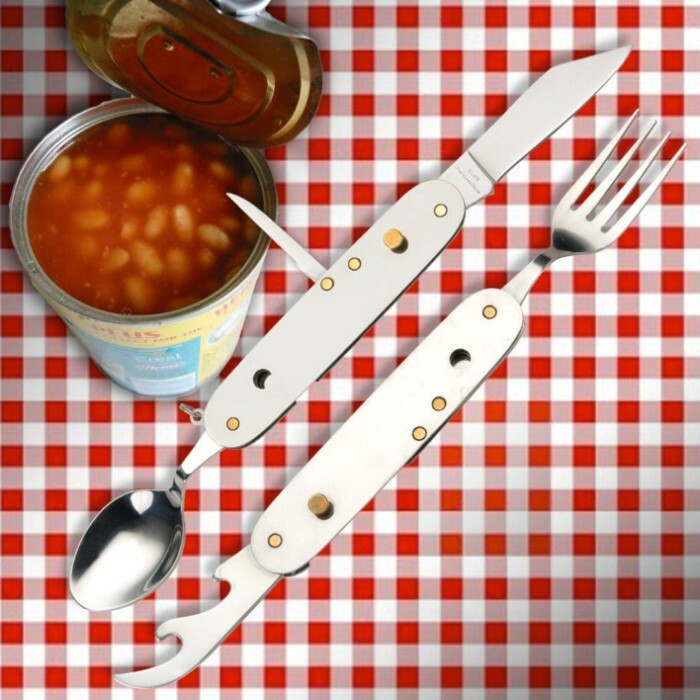 Fork, spoon, knife and can opener, what else do you need on a camping trip? 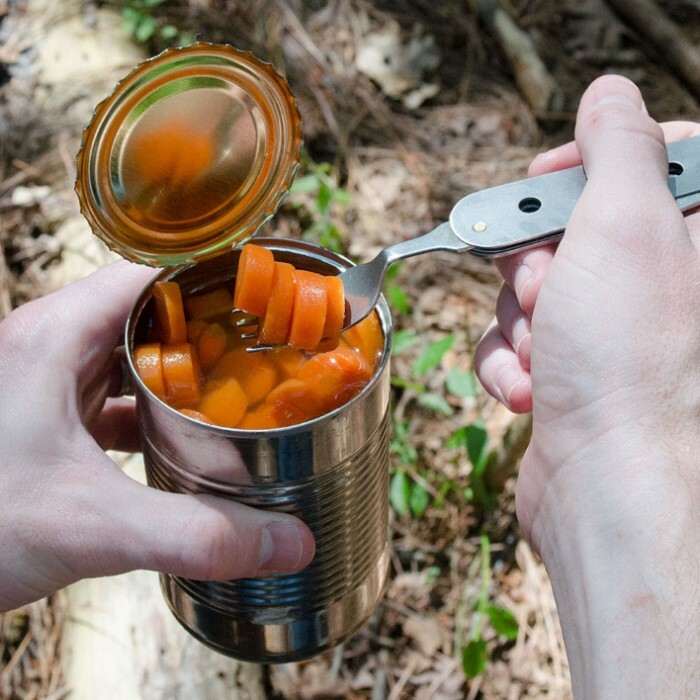 Throw one of these camp dining tools in your backpack for your next hike up the trail. 7" overall, 3 1/4" closed. she took both of these I ordered. got to order me some now. Bought this for my son as a gift. He loves it and easy to use. Not flimsy as you'd expect for the price. I've bought them a few separate times for friends and family. Bought two, then bought one more. Great quality, fast shipping. Knife fairly sharp out of the box, would cut meat. A few passes over a sharpening stone made it sharper. No regrets, I would buy again. Double locking mechanism, works great. Built to last. As bulky as it is, it more than makes up for that for it's general usefulness and it's price, and certainly uses less room that each individual tool! By the way, when it divides like the first guy said, it doesn't break; it's meant to do that so it's easier to clean and so you don't have to keep switching between the spoon and the fork when you're eating. I am 54 years old and remember having one of these as a kid. I have multiple packs, and they all have some type of cook kits in them. They now have one of these in each kit. Can't go wrong. This is a real handy item. I bought four and have had no problems with any of them. The knife will need a little sharpening, but that's no big deal. 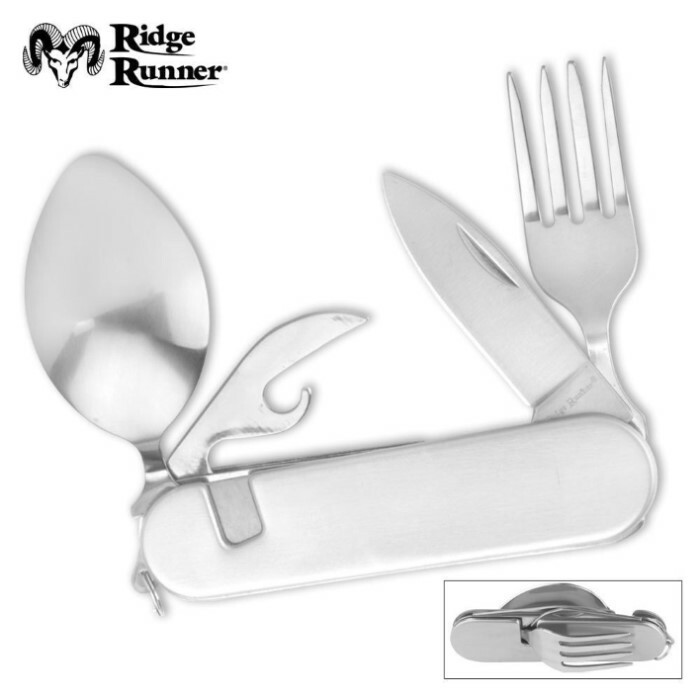 It is a good design that splits apart so you can use both the fork and knife simultaneously. This helps with clean up too. A really good value for any camper. Bought 4 one for each of us. Walked the family through how to use it. Everyone loves it. Easy to use and very functional.